To those here who buy foreign parts and need a currency exchange. Those who send friends and family- they are on to you and have a variable fee now. Those who sell and provide a refund for some reason, full or partial, the deal wont be unwound with no cost to you. Or, the march continues. Profit margin is king. I saw the notice. Thank you for posting. Yeah. I got tagged with a fee on my last deal. It was good while it lasted! Damn. The Man gotta has his. Cite your source please because PayPal fees as just a second ago see below..
Last edited by SamSpade1941; 04-15-19 at 02:56 PM. +1. PayPal source please, and clarification - are these three different new issues? What's the variable fee? What's the "unwinding" fee for refunding? Too many things left open here. Not questioning it, but would help others here to know the specifics. 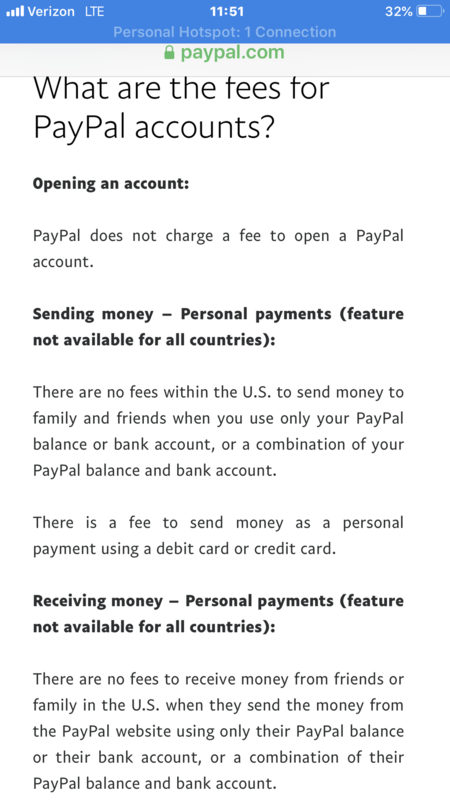 Sounds like there are no Friends and Family fees if you use funds from you PayPal account or directly from a bank account. Credit and debit cards charge a percentage or fixed fee for transactions so unless the PayPal fees are unreasonable, I don't see a problem with that. To me it looks like PayPal's end goal is to get more involved in banking which is pretty much what they already do but with less legal restrictions. Last edited by verktyg; 04-15-19 at 08:05 PM. The big change is that if you refund a sale, Paypal will not refund your fees. This is all over other boards as well. If you sell a $500 item and that item is returned, the buyer is refunded his full $500, but Paypal keeps the $15 in fees that the seller paid on that sale. The seller eats those fees. Combined with eBay’s policy (if that is where the sale occurred) of siding nearly 100% with the buyer in any dispute or return, sellers are likely to see their costs rise. I am not aware of any (reputable) merchant account that would do the same. It appears to be a gross overreach by Paypal. Pretty we’ll all credit card banks follow the same practice. They’ll usually refund the fees if you call but it’s a hassle and not the default process. Good luck trying to call PayPal and get them reversed. For a while, E-Bay has had an option "Pay with Credit/Debit Card". Has anybody ever used that option? And look where that got him . . . . I have always refused to pay using the friends and family option because I feared I would have no recourse if the deal went south. Without looking it up I think fees are about 3% plus 30 cents. On a $100 item I would just send $103.30. Not enough to squabble over. That being said, BF members are the most trustworthy group I have dealt with on line. I have never not used friends and family option with BF members, and I've never been burned. If the member posts a lot here, I just don't think it's worth the karma hit. Yes. You get both eBay's heavy-handed anti-seller protection and your credit card company's protections, if they have some. However, I like the two-way protection offered by PayPal. Even when people ask for Friends and Family, if I'm buying something, I add the 3% and used Goods and Services, because I want the protections provided. I buy much less now than I used to. Swap meets are much more fun, as well as sales at the dwindling number of bike shops left. Besides, I don't have any Friends & Family.....that still talk to me, anyway. Last edited by RobbieTunes; 04-16-19 at 09:55 AM. So, this is primarily Friends and Family going overseas? Perhaps they should try something different with Canada. I don't think I've ever used "friends and family" overseas, although I could imagine some people with close friends & family in Mexico/Latin America that would use the services a lot. For general transfers in the USA, I doubt PayPal loses a lot, as an E-Bay credit for many of us casual users results in a balance (earning interest for PayPal), followed by legit PayPal purchases (earning commissions). I haven't tried cash withdrawls, but perhaps that would be the key, to allow inexpensive balance transfers, but not allow withdrawals unless there are actually fees collected... at least in general. Paypal's a business, and they are in business to make money. They are also a bunch of extremely smart people. Anyone who thought PP would allow users to send money back and forth to people who clearly are neither friends nor family without cost or recourse was fooling themselves. Surely, they are just as capable of viewing posts from people (not just here, but all over the place) who SELL things and ask SPECIFICALLY for payment via F&F to avoid seller fees. So, yeah, eventually things had to get tightened up. If'n you don't like to pay, don't play. True. Bad karma gonna get you. I think this change will have little effect on transactions on this forum (and ThePaceLine where I also hang out) as my impression is that sellers typically state "request" that buyers pay the fees as part of the purchase if not using F&F. Like Robbie, I just include the 3% rather than deal with F&F's lack of protection. For SamSpade1941- these are upcoming changes, to take effect in early May. @repechage ,, all I am really seeing here is that F&F transactions to foreigners are affected ... It just doesn't affect me I do not buy from individuals overseas . Most of what you are complaining about really doesn't affect most individuals who use paypal . I sell so very little on ebay its not really an issue TBH . If this is an issue for you however , you might consider using crypto currency . Are there any other viable alternatives to paypal or ebay? Or, is it a case of "there's Google and then there's everyone else". BTW, I rarely use Google now. actually there are alternatives, Apple pay is a good example .. as is Samsung Pay or Google Pay , take your pic. I use Paypal because I have had a paypal account as long as there has been a Paypal however there are other options and if you do sell on ebay you can just as easily opt to use another payment method its not required to use Paypal that tether was cut a few years ago . There is also the Cash App (formerly known as Square Cash) is a mobile payment service developed by Square, Inc., allowing users to transfer money to one another using a mobile phone app. ref: https://en.wikipedia.org/wiki/Cash_App . Another feature of this app is working with cyber currencies thus being very low cost. Im a long time paypal user and may start using other epayments if this trend continues since I have always maintained a cash balance and dont want to be penalized by actions of bad buyers. This. And, being a foreigner, Paypal has been a godsend for the 15 years I've been using it. Interesting to me at least, is that Venmo, another payment service that just happens to be owned by PayPal, does not have all the PayPal fees, yet. I haven't really investigated it, but I should.